A 2011 map dusted off. The green space to construct this line (designated for future housing) is easier to see on Google Maps as is the way the line could be linked into and under Johns Road and an elbow in Orchard Road. Small spur to the right, at Redwood is now probably, truly spurious! NOTE This blog posting is a revamp of an original posting I made in 2011 and reworked in 2017. With a very real possibility that the current Labour-First-Greens Government will build and fund (most of) the re-introduction of commuter rail to greater Christchurch I have simplified and updated these ideas. (b) A loop route taking in multiple industrial zones and workplaces. (c) direct rail tofro the international airport, from Greymouth; from Picton and Kaikoura, from Dunedin and Timaru, etc. Suggested nature - grade separated double tracked. The nature of this new Islington-Redwood link suggested here could be double-tracked, and grade separated. That is to say, there would be no intersecting roads at all, between Islington and Redwood. The above ground sections of track might also be protected by embankments on either side with trees, shrubs etc. adding to the local landscape, reducing sound and hiding high netting fences that protect the line from trespassers. Freight trains or "Rangiora via Airport" or "Dunedin-Christchurch (via Airport)" trains would be able to operate at higher speeds while on this protected corridor. The double track line would probably pass under a new four lane overbridge on Yaldhurst Road. This also offers access via underpasses to Russley Station - which includes a large Park and Ride car-park for residents from West Melton and Russley area - voiding the need to bring their cars into the central city. As it approaches Christchurch International Airport the double track rail line Would need to descend gradually into a cut and cover tunnel, passing under George Bellow Rd, Sid Bradley Rd, Avonhead Rd and under the grassed area immediately adjacent to the end of the east-west orientated runway. A cut and cover tunnel would be constructed under the alignment of Orchard Road with an station near (and beneath) the current roundabout and Antarctic centre area, possibly constructed in a similar manner to that shown below. Passenger trains would always need to be electric or diesel-battery hybrid, but freight trains behind the wall could be conventional diesel, with exhausting fans and ducts in the tunnel if needed. 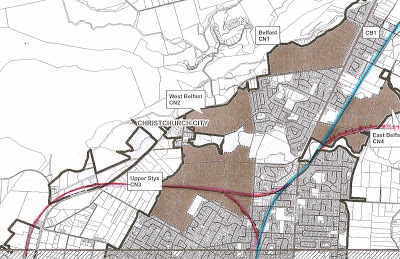 With this new Christchurch corridor double tracked, the passenger trains from either direction would stay on - or in some cases veer over to - the westside track, that is, the one nearest the airport with its passenger platform and facilities. This might also offer train passengers a travelator to the nearby airport terminal itself. All inbound passenger trains, could take passengers to the city - whether via Hornby or via Papanui, presuming many long distance passengers would alight at the airport, creating vacant seats for this last leg. Long distance trains from Picton, Greymouth and Invercargill, Dunedin or Timaru, would always enter and leave the city via Airport. I would imagine that would probably triple the potential patronage of these long distant train services. Off setting the cost or bother of driving to Christchurch and leaving the car with friends or paying airport area long term parking, would be the simplicity of getting a lift to the local station, by friend ot taxi, boarding the train in one's hometown, and getting off at airport. This would, in effect ,create a direct /continuous public transport service, for example, between Temuka and Sydney, or and Amberly and Singapore!! When there are major events, such as rugby tests, big star concerts, extra trains could run straight from the stadium to the airport after the match. Possible route for rail corridor, coming from airport under John's Road in red, joining existing line in blue. Probably less than 20 built upon properties would need to be purchased . Within a few years all remaining chance to (relatively) easily build this track through northwestern Christchurch is likely to be built out. In this scenario freight trains during the day would always pass through the airport area on the eastside track, behind the wall shown here. During the middle of the night, when passenger trains are not operating, freight trains can use either track, airport side included if pulled by a suitably non-polluting locomotive The double tracks could be worked as traditional "up" and "down" lines. This suggests the designated South Island Main Trunk Line could be shifted to the far superior and more flexible newly built section of line via airport, rather than the current line between Redwood, Papanui and Addington. Preserving the current single line between Styx and Addington (and retaining the attractive cycle and walkway) and constructing the airport loop would in effect give Christchurch three lines of access tofro the North. This is good future-proofing. In the peak hours one or two commuter "express" trains will no doubt travel tofro Rangiora and central Christchurch direct via Papanui, Or tofro Rolleston and city direct via Addington. Most timetabled services at other times, including evening and weekend services and all inbound and outbound long distance trains - I would image - would loop via airport. As a well used line, serving a multitude of functions, any service that runs via an International Airport, is likely to attract more passengers and more likely to have the most frequent services (similar to the Orbiter bus route in Christchurch). Speed of public transport is measured by total journey time across all travellers, including waiting time (i.e. the time span between each departure) Frequent all stop services meet more needs and are per se faster than infrequent express services, the latter best reserved for targeted use only. The commuter rail benefits include a reverse pattern flow - comfortable inner city apartment life-styles fostered in central areas because it is possible to get to work by rail to almost every major employment zone - as far afield as Rolleston or Rangiora. Peak hour flow that goes in both directions is of huge financial benefit to any public transport system!! Commuter rail in a low density, car user heavy city as small as greater Christchurch is a very big call! I believe this plan would make it viable. For years we have heard people [myself included in early NZ in Tranzit blog postings!!] saying it can't be done, we are too small - OR saying it can be done, cheaply by using tired old third hand carriages or units brought from Auckland, on the existing lines, or even, most absurdly, as a temporary trial. That is not what quality public transport is about, following belatedly along behind other modes of transport, belatedly squeezing minimum impact, minimum cost, minimum game changing infrastructure into crowded cities. 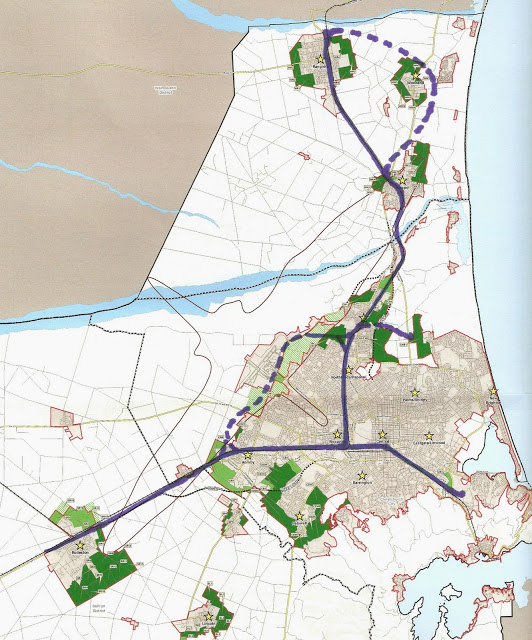 Good public transport corridors should be built as an anchor infrastructure, at the very centre of city planning, ideally before housing is built (opportunity missed in Rolleston but still possible around Upper Styx, and north of the Waimakariri. Good public transport is a city builder, a game changer and an absolutely necessary future proofing. Auckland has well understood this and has spent (or is planning to spend) billions of dollars on public transport, with much of this Government funded, including from Canterbury taxes. Pro-rata, on population size compared, Canterbury is well overdue for a public transport investment very least, at into the low billions. I believe creating a primary rail corridor, linking urban sprawl north and south to the very centre of the city, to the city's major hospital, the province's main sports stadium, to multiple industrial areas, and to the airport doorstep - all on one line is one helluva world class act. Ooops, all most forgot! Add to this the fact that residents and tourists alike would be able to hop on a train at Greymouth, Dunedin, Timaru, Marlborough and Kaikoura rail right to doorstep of the International Airport. Well worth the billion dollars it might take to build! Noted - I see this concept as the twin investment to building a cut and cover tunnel under Hagley Park and Tuam Street and bringing rail right into the centre of Christchurch, including immediate access to the public hospital, bus interchange and main sports stadium and exhibition centre. Christchurch Airport is planning for 12 million passengers per year by 2040 an equal number of people expected to travel to the airport to greet or farewell passengers. 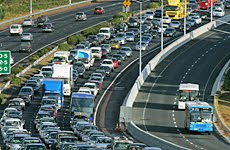 Currently Christchurch International Airport area sees 50,000 vehicle movements a day. On yer bike training - Te Wai Pounamu "rail & trail" potential explored. Somebody or other - I think it might have been Carl Jung, the famous Swiss psychologist - defined "intuitive" as "seeing the possibility in things". We all have this ability, but with some people its more pronounced, just as logical thinking or a practical feel for things, or sensuous appreciation are more pronounced in other people. For better or worse I find it hard to look at anything at all, without trying to join up the dots to something else, constantly seeing the possibilities in how an object, or event, a concept might be developed further. Two separate ideas on the boil for me at the moment are; bringing commuter rail into the very centre of Christchurch and, closer to home for me nowadays, promoting the concept of an off road [mainly] cycle trail down through the central eastern seaboard of Te Wai Pounamu. Me being me, it was pretty well inevitable as soon as I turned my back these ideas would hop into bed together! I have come to believe that this great southern cycle trail route would put tourists on to South line trains in far greater numbers than conventional tourism alone will do. Although a lot of local people would drive to the start point of a cycle trail, unless you want to repeat the scenery in return journey, there is always the problem of getting back to the car. A cycle trail interacting at various points with a through line, between Christchurch and Dunedin, as suggested in a previous blog posting, and trains which have special train cycle carriages, could solve a lot of problems and between these two modes generate a lot of extra tourism. Indeed the influx of several thousand cycle trail tourists, mainly in the eight months suitable for open country riding, could be the very factor that would make a commuter service to and from Timaru truly viable. I mean mum, dad and two kids (aged 10 and 12) and their four bikes, heading south from Christchurch for a four day off-road cycle from Timaru to Oamaru via Waimate and Duntroon. Train down and train back. Cheaper than hiring cycles, and the kids get a rare chance to ride the rails. "Rail & trail" Could also prove very popular with overseas tourists and those flying in from the North Island, particularly if the trains for Timaru and Dunedin travel via Christchurch airport before heading South (and returning trains enter Christchurch via the Airport loop as well). A great way to cram a lot into a short break of a few days. Railing from Christchurch is also a very handy way of getting cycle trail users, heading for Methven and the (potential) start of the trail, over the "mile wide" Rakaia, onto the south side of a very long narrow bridge. Is it possible that even a test-the-water, bare bones service, one train a day to Dunedin and return, and another from Timaru and return, only, could meet the needs of commuters AND cycle trail riders? As usual I could not resist playing with timetables to see. Here is one set of possibilities, times are reasonable guesses based on road times and memories of the evening railcar service Christchurch to Dunedin back in 1970s. The strength of this arrangement is it provides a commuter service between Timaru, Ashburton, Christchurch International Airport and Christchurch (presumably supplemented by local commuter service tofro Rolleston) at times not only convenient to workers, or South Canterbury residents flying overseas, but also to cycle trailer riders. Many different train & cycle options are inherent in these times. A Great Southern Cycle Touring Route? I live in South Canterbury these days and have been promoting the idea that a central Eastern South Island cycle trail be built between Methven in the Ashburton District and Palmerston, the southern most boundary of the Waitaki District. This would offer 360 km of cycle trail incorporating many of the smaller centres of Mid and South Canterbury,and North Otago, as well as many scenic areas - inland, foothills, coastal and riverside. Full length journeys would probably take at least 5 or 6 days, relaxed journeys even longer. The aim would be to create a Great Southern Cycle Trail of a consistent quality, size and stature to be accredited by Nga Haerenga, The New Zealand Cycle Trail as one of the "Great Rides of New Zealand". If built this would be a cycle trail that would be easily accessible from multiple points along the route, for shorter rides. It would also be easily supported by bus and bike trailer support systems, for guided tours, for access from Christchurch and Dunedin, or for riders who wish to bypass some sections, where this is preferred. Noted too, some trail users are people who prefer cross country walking*, and welcome heavier packs being transported between accommodations. All trails take routes through scenic areas, often unseen or unknown by motorists, and this trail would too. But unlike some of the Nga Heurenga rides constructed to date, a trail through this seaboard area would encounter relatively little true wilderness, tussock high country and rocky gorge, and only relatively small areas of native forest. The route is much more consistently one of rural farmland, village life, and areas with much retained built heritage. This could well suit some cycle tourists or others making return visits to cycling trails in the South Island Te Wai Pounamu. It would also obviously draw a lot of immediate patronage, not only from several large towns and Timaru city en route, but also because, the trail sits between Christchurch and Dunedin along an eastern seaboard populated by three quarters of a million people. Usefully, for A to B rides, and North Island riders, the whole trail sits between two major airports. Note. I am assuming an inland loop route within Ashburton District, to avoid the more monotonous quality of the plains nearer the sea, and the wish to avoid heavy traffic or crossing busy highways. This includes the difficulty for cyclists [and hindrance to motorists] of crossing the Rakaia and Rangitata rivers on very long narrow road bridges, on busy State Highway 1. The envisioned route (south bound) would nonetheless travel at first along fairly flat plains with an alpine backdrop (albeit snowless most of the cycle touring season), travelling from Methven and Mt Somers to Geraldine (or overnight at Peel Forest) and then a further section down towards the coast, via Temuka and along to Timaru. The next leg would continue with coastal views (albeit mainly from cliff top) south to St Andrews, and then at some point (possibly Esk Valley) head inland to the small town of Waimate. Leaving Waimate by the old rail corridor through the gorge, the trail would travel to Ikiwai and the banks of the Waitaki River. For this great southern cycle trail to have any status or credibility I believe it will be necessary to bridge the Waitaki with a cycle and pedestrian bridge at this point, a great chance to create a very attractive landmark bridge, and also an iconic promotional image for this diverse trail. Not least this bridge would hugely symbolise the linking of Canterbury and Otago by cycle trail. My guestimate is this would cost circa $10 million - the new wide (heavy traffic suitable) bridges further upstream at Kurow costs $20 million - and would definitely need to be a central Government project. Possible features might also include an interpretation centre, for river wildlife, fishing and history, Maori and European. Also car parks, for tourists in vehicles, who are also likely to want to visit the site and walk the well-publicised bridge high above such a strong river. Noted, South Islanders often forget that wide braided rivers of this nature are themselves relatively rare phenomena in this world. A few kilometres after crossing the Waitaki River cyclists encounter Duntroon and the Alps 2 Ocean (A2O) cycle trail from Lake Tekapo to Oamaru. In this case the cycle trail already exists and links through Windsor and on to the route of a former branch railway line. The trail follows down into heritage gem and steampunk capital, bustling and reborn Oamaru. Two "name" cycle trails would share the same route corridor through this area but this seems inevitable as New Zealand cycle trail networks expand. The last section of this southern cycle trail would continue south to Palmerston presumably along the Kakanui coastline and down through Moeraki, and possibly Trotters Gorge. Such a trail is already consideration by the local authority, the Waitaki District Council, as an extension of the Alps to Ocean Cycle Trail. Waitaki has clearly seen the success of cycle trails and is well ahead of the game, not least the potential to get funding from the Provincial Growth Fund recently announced. Over and beyond sharing the beauty of our country with fellow kiwis and overseas visitors - the greater purpose of cycle trails is to create an attractive conduit for money from the cities to flow back into provincial economies. Re-cycling money, creating good health, creating good holidays, creating vibrant rural centres, it's just one big healthy cycle! I am retired, an open country walker (including along cycle trails) rather than a cyclist, and have no official status in this matter whatsoever! Nothing in life is ever what it seems. Look at all parts, not just the obvious. This has long become my rule of thumb. An interesting example just appeared in a leading United Kingdom newspaper. According to The Guardian; a report launched last week has revealed that the cycle industry in the United Kingdom is worth three times more than the steel industry and employs twice as many people. According to this report cycling-related businesses generate, at least 5.5 billion pounds in the UK economy and sustain 64,000 jobs. Some of these are in bike shops (and presumably manufacture) but most of these are in cycle tourism, of one sort or another. The Christchurch Railway Station is too far from the centre of the business and commercial area. This has been a complaint since 1863 !! Complaints were expressed even before the city's first station opened on "South Belt" (Moorhouse Avenue). Calls were made for horses to pull the detached railway carriages (arriving from Heathcote) up into the central business area. As researching old newspapers will reveal, the distance of the station from the centre of the city it has been constant Canterbury grievance for 155 years. In 1993, and the then privatisation of rail, the city's “central” passenger station was moved to an even more distant location, at Addington. Any suggestion of re-instating a regional commuter rail network falls at this, the first huge hurdle: - If most of the passengers have to transfer from the train service to buses to access the city centre, it negates any time saving efficiency and renders the whole system too clumsy and expensive to be attractive. Car usage in the modern age has created a cultural expectation of door to door travel with immediately adjacent parking – this has becoming increasingly difficult to achieve in a congested city, but it is still the gold standard. However, subject to further investigation, there appears to exist an unique opportunity for Christchurch to bring commuter rail services right into the heart of the city and to do so at a relatively low cost by world standards. Such a move seems likely to boost central city revival and increase investment in new businesses and employment significantly. Inspiration is offered by the construction of the circa $2.8 - $3.5 billion City Rail Link in Auckland, a 3.5 km underground loop line from the city's main station, Britomart,up to Mt Eden and the western rail corridor. The first kilometre of of the Auckland underground system, from Britomart is a "cut and cover" tunnel just below the surface. Most of the remaining underground will be bored at a deeper level - this is a necessity because the Mount Eden part of Auckland is situated on hills too steep in their incline to allow the railways to follow exactly below surface slopes. Of particular interest, is the way the City Rail Link follows the alignment of Albert Street through central Auckland, a huge trench being dug out (one side of the road at a time) and then lined with reinforced concrete walls, creating two parallel tunnels. When a concrete ceiling is placed on these, and the various underground services are reconstructed, the road above will be restored as it is now. This concreted trench tunnel will allow commuter trains to run in both directions some metres below the street. At a quick glance it seems surprising that such a massive excavation can occur right in the midst of large tower buildings, but it is of course common to excavate large holes for the foundations of high buildings, with one high rise excavated right beside another. An added requirement, and an often huge cost of tunnelling under established streets, is the construction of new alignments for other underground services, such as water pipes, sewerage, electrical cabling, stormwater drains, etc., along or across the streets. I believe, if the political will was there it would be possible to build a similar cut and cover tunnel, offering two railway lines (possibly more at station points) and three simple underground stations, starting from a point near the current Christchurch railway station at Addington, into the commercial and business heart of of central Christchurch. 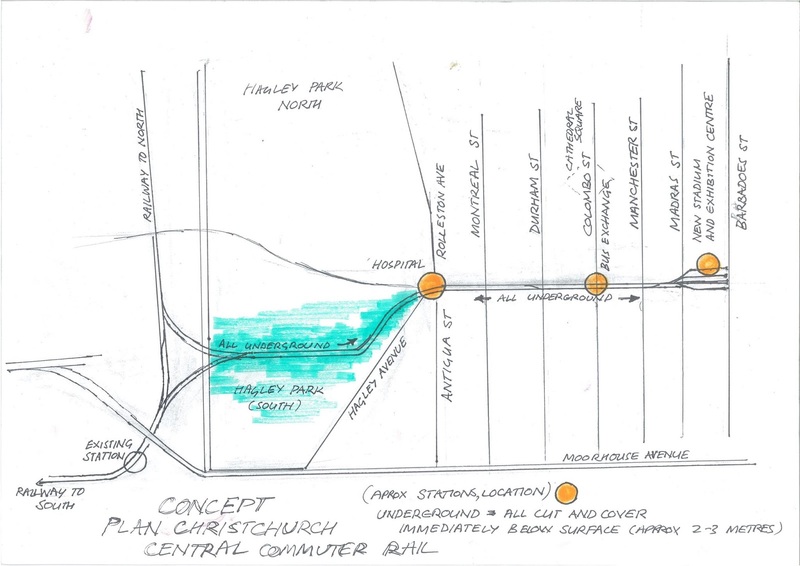 The suggested cut and cover tunnel could be built across - that is to say well under - Hagley Park, under hospital corner (and an underground station there) and under Tuam Street to an underground station complex near the Bus Exchange and Colombo Street. This cut and cover tunnel could then continue on to an underground terminus at the planned new sports stadium and exhibition centre between Madras and Barbadoes Street. This scenario would require the purchase of part of the former stock sale-yards site, in Deans Avenue, now demolished and currently in temporary use as a one level car-park for the hospital, served by shuttle buses. All other land required I believe is in the public domain, requiring no land purchase costs or legal disputes. I have included here some ballpark figures for likely costs. Noted; these are not minimised to be appear more palatable to potential opponents, but realistic in terms of similar projects in other cities. Large "game changing" and city building infrastructure of this nature, designed for long term benefits into the billions, can not be built by enfeebled suggestions of reusing third-hand cast off rail units ex Auckland, or (most bizarrely) creating a "temporary commuter rail system". Rather costs are broadly calculated in reference to similar projects in Auckland and Wellington, obviously this can only offer a very rough guide, but not one I hope completely amiss. It is envisioned that from the main trunk line between Addington and Riccarton Road (running parallel with Deans Avenue) two separate lines would branch off heading eastwards in to Hagley Park. One line would offer access to trains tofro Rangiora and north, and the other access to trains tofro Rolleston and south. Both these lines would follow a gentle downward sloping curve that would take trains under Deans Avenue and then under Hagley Park. This might require a slight rise to carry Deans Avenue over the tunnel entrances, or even a slight landscaped hill at the edge of Hagley Park, to allow a sufficiently graduated slope into the two railway tunnels. Once under the park these two curving tunnels would come together and become either a straight double-track tunnel, or two parallel tunnels, and head underground towards "Hospital Corner." Tunnelling costs around the world, are greatly effected by the surface being cut through but there will be no unexpected hard rock mass under Hagley Park or central Christchurch. Drainage will no doubt be a factor, but building a cut and cover tunnel through shingle or soft ground across the open space of Hagley Park, is likely to be cheap tunnelling by any world standards. Allowing for complex railway junctions and all safety and ventilation aspects, on roughly similar projects, I'd guess cost for this section, probably under $60 million. After completion of the construction phase of the cut and cover tunnel, the earth and grass would restored over the tunnel ceiling perhaps two or three metres below ground-level. There would be no obvious change in the appearance of Hagley Park, other than a possible removal of a few large trees whose roots would otherwise interfere with the tunnel. There has been public resistance to past proposals to build car park facilities under Hagley Park – but that concept by its very nature feels a violation. I would imagine this option, intrinsically fostering a “greener” more pedestrian friendly Christchurch, would encounter a much smaller rump of opposition. At Hospital Corner, the tunnel would pass under Hagley Avenue and into - and of course under - Tuam Street, with obvious potential for station at this point. The existing under-road pedestrian tunnel for hospital staff and a separate public pedestrian tunnel could link to the hospital and outside areas to platforms on both sides of an underground station, as well as to the bus stops above. 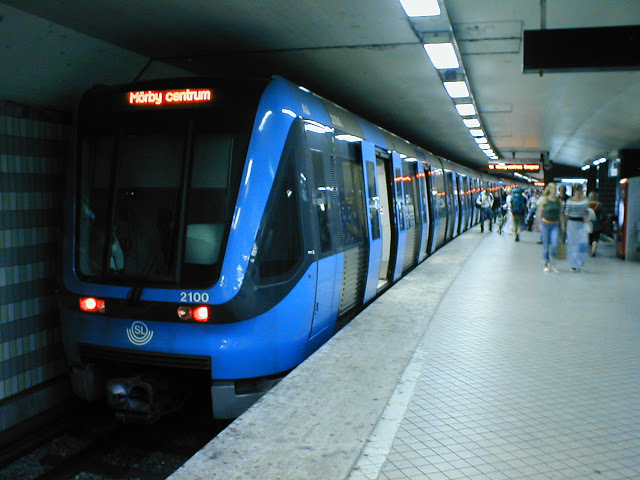 Modern underground stations typically have glassed off tracks, these platform length doors only opening when trains are actually stopped, preventing accidents, suicides, graffiti etc. The "Hospital Corner" station would offer easy walking distance access not only to the hospital and medical school, but also to the planned Metro Sports Facility, Hagley Learning Centre, Hagley Park and the cricket oval, the Botanic Gardens and boatsheds, Museum, Arts Centre, Christs College, City Council buildings and to the office blocks and apartments west of the Avon. Passing under the alignment of existing streets will be considerably more expensive than tunnelling under open park land. This said, the length of track suggested here, from hospital corner to the suggested terminus is not much over one kilometre. Based on the one kilometre of cut and cover tunnel being cut under Auckland's far more intensely developed lower Queen Street and Albert Street (where large storm water works also had to be shifted) I suspect that such distance in Christchurch might be constructed for about $200 million. The two simple underground through-stations with above ground entrance foyers, at the Hospital, and a City Central station, near Colombo Street/ and linked to the Bus Exchange might add another $60 million. These stations are fairly close together, the trains between them would virtually just slide along at under 20km, but link directly to the different mass catchments, including direct access to all Colombo Street and Cathedral Square. A third station and terminus, only three blocks further east is also suggested and would be need for operational reasons anyway. The terminus could be about 400 metres further along under Tuam Street between Madras Street and Barbadoes and directly beside or under the proposed new giant sports stadium and exhibition centre. This might also sensibly include an underground stabling area, four to six tracks wide, or similar. This could create significant operational economies as overnight night, or during the off peak period during the middle of working days, some of the trains could be parked and cleaned here. Constructing a couple of island type platforms could also allow various units, and longer locomotive pulled trains, to load simultaneously (including those for Dunedin and South Canterbury etc.) following major sporting events, or during large exhibitions and festive events held at the stadium. This station might cost another $60 million, although possibly it might instead be built and leased back by the stadium builders or operators. Potential savings in terms of excavation, pile driving, stadium/station pillars etc. might also be achieved by simultaneous construction. Both the Central City station and a Madras/Barbados Terminus, in the scenarios here would offer easy walking access to the Justice Precinct, the new Hoyts 7 Cinema complex, the Bus Exchange, Ara (Polytech), Catholic Cathedral College, High Street and Cashel Street Malls and Laneways and only slightly longer walking distance, Cathedral Square and other parts of the central city. The area of the central city south of Cathedral Square has always had more capacity to form the busiest shopping, commercial and business part of central Christchurch - the suggested railway line conveniently intersects this primary activity zone. Obviously it is not suitable to use diesel power in busy underground tunnels. Electrification of Auckland railway cost $1.3 billion, not counting the new trains. The huge cost of electrifying all the Canterbury lines could be postponed for many years, or even permanently avoided by using hybrid passenger rail units and locomotives. These systems can operate with batteries linked to either standard diesel, or with overhead powered electric trains. When running only on the batteries these locomotives or units are capable of pulling surprisingly large loads (over a thousand tonnes) over reasonably long distances, typically 60-100km. Several international railway vehicle builders now offer hybrid options. Indeed, Auckland Transport had planned to purchase 17 hybrid such hybrid electric units, until both the main political parties announced they would fund overhead electrification of the line between Papakura and Pukekohe. The added chance to recharge batteries from an overhead power supply, every time, whilst running through the central city tunnels, or while parked at mid-day or overnight in the underground terminus, would clearly support such a system and ensure smoke and exhaust free operation in the tunnels, as well quiet running trains as far afield as Rolleston and Rangiora, perhaps using diesel only beyond these points. A fleet of, say 20 hybrid 140 seat passenger units, and several separate hybrid locomotives to shunt or pull conventional coaches (including dedicated cycle coaches on the main peak hour trains) - the minimum rolling stock needed to operate a sufficiently frequent service (given population and regional distances) - would probably cost about another $250 million. 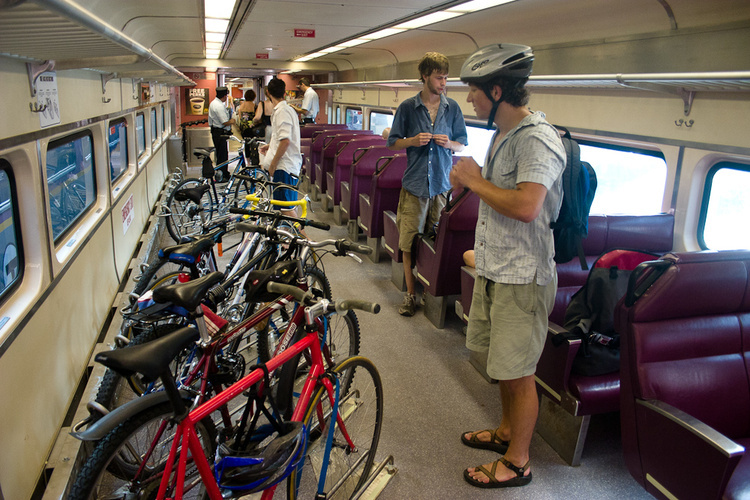 For those who need to cycle at both ends of their rail journey, peak hours trains (rather than units) could probably include dedicated multi-cycle carriages as used in the New York area. The general upgrade of railway across the city to allow for commuter rail and (and no doubt a chance to improve freight movement) would also be needed, this might absorb another $200 million, and might include over-bridging of rail tracks on some arterial roads and the building extensive car parks for commuters in outer suburbs and towns. Wellington railway has over 4000 such car parking spaces across the region, Auckland is struggling to create more. The old equation “public transport versus private car” still occurs in local newsmedia or politician speeches; - it does no justice to “park and ride” character of public transport in many modern systems serving sprawling built-up metropolitan areas. (Boston for example has over 46,000 park and ride spaces – in other words 46,000 cars that don't get driven into the city or on congested roads). Secure bicycle day-storage systems would also be necessary at most suburban stations. I am only an amateur "train (and bus) spotter" but I believe it is possible that this core system could be created for around $600 million, spread over several years., and a $250 million loan for the purchase of trains. These actual amounts could be more accurately determined by professional engineer or a proper feasibility study. If Christchurch is going to catch up, it needs to face realities and lift its game and its vision, study comparable systems in New Zealand and overseas and seek intelligent levels of funding. The city has wasted over two decades investigating piecemeal and underfunded proposals utilising third hand rolling stock and inadequate stations, including such professional absurdities as a “temporary” commuter rail system! It has also completely ignored bus-way corridors, by-passing congestion, and taken an absurd 20 years merely to establish bus lanes on short lengths of congested roads! Local and Regional authorities to meet only half the cost of construction? This $850 million seems (and is) a huge amount of money, BUT on the precedent of Auckland and Wellington it might be expected that central Government would provide a $250 million loan for purchasing modern rolling stock. This is then repaid as an annual operating cost by the regional authority overseeing railway operations. By similar precedent, central Government would also fund about half of the construction costs, these met directly by central government and its agencies, and in some aspects as part of KiwiRail. Despite such a large sum, it is well below large tax-payer amounts spent (and to be spent) in Auckland and Wellington. That greater Christchurch should seek about $300 million in direct Government support seems nothing but a bit of "transport equality" and “balancing of the books”, given the huge investment by Governments (both Labour and then National) in commuter rail in Auckland and Wellington. Since 2003 Auckland has received at least $3,300 million in government support for rail and busway infrastructure with $1,400 million (and more if needed) promised for the underground City Rail Link loop, previously mentioned. Since 2007 greater Wellington – like Christchurch only quarter the population of Auckland - has only received $500,000 in Government grants and loans towards upgrading railways infrastructure. Just before Christmas the Greater Wellington Regional Council announced it was seeking another $200 million from Government for a further rail upgrade. Further pressure is on for Government funding of light rail to the airport, which on similar costs to the Gold Coast light rail, will require well over a $1000,000,000 dollars and make little difference to journey time. Both these cities have had an obvious strong case for public transport infrastructure funding from taxpayers, Auckland because of its larger size and rapid growth, Wellington because pf its geography, its restricted central area and bottleneck approaches. This greater need has been recognised by the estimated billion dollars taken out of road and fuel taxes generated in Canterbury and transferred to projects in northern cities. And this said, the population of greater Christchurch is actually larger, faster growing than that of Wellington region and the extended metropolitan area population of Christchurch is expected to surpass that of greater Wellington region over the next 25 years. (NZ Transport Agency Stats - circa 567,000 versus 527,000) Simplified graph here - [or see "Lies, Damned Lies and Statistics" page in right hand side box; this also determinines the comparable commuter zones, matching apples with apples]. Extremely rapid growth of both Rangiora and Rolleston, and adjacent areas, makes it clear tomorrow's “greater Christchurch” will, in effect, be something of a banana shape extending over 25 kilometres northward and over 25 kilometres southwards. Greater Christchurch too has its bottleneck too – the crossing points of the Waimakariri River and - not least - the finite capacity of the city's own arterial roads and urban intersections to provide effective peak hour journey times. Exactly the sort of profile best met by commuter rail. Wellington also has it's Wairarapa Line - $25 million was spent on carriages and line upgrades to from Wellington to Masterton (80km), a service which now offers five trains a day. Could we not one day see at least an early morning commuter train from Timaru and Ashburton to Christchurch, to the benefit of all Canterbury areas linked? On precedents set in Auckland and Wellington, direct grants from the Government or Government agencies or incorporated in KiwiRail capital works, would meet about half the construction costs, leaving $300 million to be found from local and regional public authority sources or from public-private partnerships. Creating a central city rail corridor seems so fundamental to making an increasingly vibrant and attractive rebuilt Christchurch a truly dynamic city centre easily fed by the larger catchment of metropolitan sprawl. This includes being able to tie together the main new growth areas in Rolleston and Rangiora, and keeping the cultural, sporting and business heart of the whole Canterbury province accessible to all. It also allows easier access to housing and employment across the whole metropolitan area, including those in inner city apartments. who residents work further afield. In this light central Government assistance to the tune of around $2-300 million is not an absurdly large expectation. In fact $100 million is already promised by the new Labour government for commuter rail in Christchurch, though this would amount would offer far too little make any sort of effective or game changing attractive system in itself. As is obvious, no railway construction is cheap, but once established, a railway line into the city centre will can create benefits for generations. 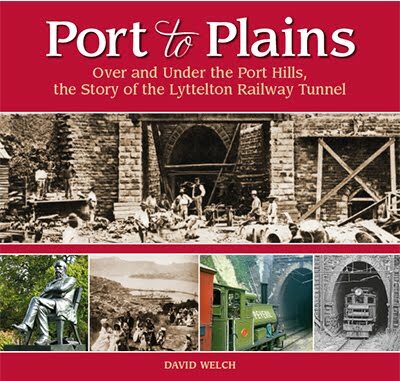 A good example of such foresight , close to home, is the Lyttelton Railway Tunnel. The decision to build that huge-for-its-era railway tunnel - the first great engineering project in New Zealand - was made in 1858 when Canterbury had less than 5,000 adult residents. These pioneers held a larger vision and the courage to build a far more difficult transport corridor than that is suggested here. Of course the approximate $900 million doesn't just buy a 2 kilometre central city railway tunnel - by seizing the central ground, so to speak (and literally) it secures the pivotal point for whole core commuter railway network for greater Christchurch. Even on just existing rail corridors it links almost 60 km of built up area to the city's heart, with obvious room for expanding peripheral lines over the decades ahead. In contrast to motorways, this is without adding further to city congestion, without increasing delays and without parking costs!! Also among other things, a commuter rail running right into the heart of the central city is likely to vastly increase construction of central apartment buildings, major administrative headquarters, and office complexes, major tourist hotels, copious central city dining and nightlife, potentially even trains operating right through the night on weekends, helping to attract super large crowds to sporting and festive events. I think this concept put forward here is such a game-changing option that the Councils should professional engineers, transport planners and accountants etc. to do a feasibility study of this concept. Used to assist this, the promised $100 million in Canterbury commuter rail funding by the Labour Government might then go far further than anyone ever dreamed. For a more detailed info on historic Wellington expenditure "Take the money and Run"
For the gross imbalance of NZ taxpayers money invested in Auckland (2013) Government asks New Zealand to massively subsidise Auckland transport? Since the original blog was posted the new Labour (Plus) Government has announced - Regional Rail for Canterbury 'On the table". Our public transport good. Really? Compared to what...? Happy New Year - Despite Everything!! Busways - hot news in today's world !! Going fast - a busway lost? Melbourne bus use rockets after funding increases. This blog is mostly about public transport and social infrastructure in Christchurch, and transit around New Zealand. Also tracked; transit developments in similar sized cities in Canada and Australia, kindred in demographic patterns, for added perspective and inspiration. NZ in Tranzit blog covers some of the new transit technology and discusses public transport concepts in general, as well. Because the blogster's day-job is in a high profile customer industry to preserve some degree of privacy he appears only as a rabbit in his profile, albeit using his real name. Christchurch also has restored trams operating on a central city circuit. Note [May 2011] - Sadly, due to two huge earthquakes (that took 182 lives) and multiple aftershocks much of the central city of Christchurch will be closed to public access for up to a year to allow the demolition of 900 severely damaged buildings. This includes a great many heritage buildings that previously gave the central city its distinctive character and (such was the exceptional ferocity of the second earthquake in February) even some of the high rises, possibly including those shown in photo above. Tram operations are suspended for at least a year. Many other parts of the city have resumed active life for both residents and tourists..
LATEST ITEMS - Depending which doorway you came in by you may need to check out Archive Section [below] to get latest items. SEARCH use the search box at the top of page and keywords to find all postings and comments on any subject SUBSCRIBE - reminder you can subscribe [further down this column or by clicking on underlined word Atom at bottom of postings] to get regular dose of NZ in Tranzit sent directly to your email address. PHOTOS mainly by author or from Wikimedia Commons unless otherwise noted. Who's Left all this stuff down the back of the bus?? TRUE SISTER CITIES - FOUND IN CANZ? YUBE CINEMA - Moving Images! 6am November 1 2013 - the stats counter shows New Zealand page views, since the blog began in September 2009 just hit exactly 43,000 - not bad for an obscure blog about public transport, even allowing only a portion of these will be readers in the fullest sense. However this dwarfed by US readership - three times the number, and total world readership. Blogger Statistics feedback also show that NZ in Tranzit blog is currently (November 2013) averaging about 1,950 page views per week. This has been dropping to more realistic levels in recent months I suspect now that potential Designline investors in USA are out of the picture. Overseas readership is still about 85% of total readership.It is a bit of a weird imbalance, but costs me nothing. The primary aim of NZ in Tranzit remains the same, to spread more advanced information, and to share new ideas, options and visions about public transport, in NZ and Christchurch. I feel a bit like some nutty hermit living in the wilderness, bearing witness to religious truth, unheard and mostly unlistened to, yet a very high percentage of what I am saying is merely passing on best practise concepts from overseas, nothing weird at all. Any intelligent blog, carrying almost correct information [and that is as good as it gets, even in newspapers!] requires hours of research, data base filing and investigation of topics. It will also probably draw upon a depth of experience that only comes with years of committed passion or involvement in the main subject areas. It's a lot of fun but also a lot of work, dozens of threads with which one must try to stay upto date. The downside of blogging, especially in periods of little feedback, is the feeling of talking into outer space with no obvious response, other than the page view counter ticking over (and perhaps this is just a mean joke by blogger geeks, a totally spurious invention to deceive bloggers someone is listening!) In these circumstances even one line responses, "right on" or "thanks for that info" or even "load of crap!" provides at least some morale boost. NZ in Tranzit (aka the dwatted Wabbit -pops up everywhere ) welcomes all sorts of feedback, comments, opinion pieces or letters for and agin ideas put forward. Apart from ticking the boxes or posting comments in the boxes provided, interested persons can also email information or comments off-site directly to Tranzwatch@gmail.com. It is recognised some readers are employed in transit or hold elected office, adding to the sensitivity involved. Be assured all correspondence or information sent to the email address is treated as totally private, except in the broadest sense of helping formulate a broader more accurate. Who's Driving this Omnibus edition? I have contributed many formal submissions and informal suggestions to city and transit authorities, from Taupo to Texas and, mostly, in hometown Christchurch NZ. Think global - act local....as Normandy in 1944 was won hedgerow by hedgerow so must a sustainable world be built bus stop by bus stop!! . Strange but true? The number of commuters heading towards the camera in the three traffic lanes, is probably fairly close to the number of commuters in the two buses in the bus lane.